A fine violin recording of Irish dance music  from 1898, Jigs and Reels, played by Charles D'Almaine. Announcement "Violin solo, Jigs and Reels, played by Charles D'Almaine. Edison record." Enjoy this spritely recording of traditional Irish dance music, performed by Edison's violinist "of record", Charles D'Almaine (to see more, click here). Another brisk violin solo of the following well-known jigs and reels: "Bannocks o' Barley Meal," "Haste to the Wedding," "Prince Charles," "Cosmopolite" and "Rory O'Moore." 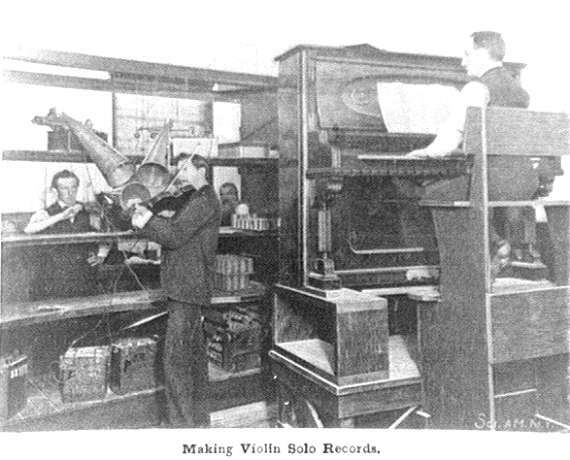 To hear other violin (and one violin imitation) wax cylinder recordings . . .